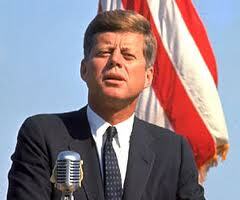 "DURING THE last days of his presidency, John F. Kennedy had a number of concerns on his mind. In tapes being released today by the Kennedy Library, we hear, for example, the president focus on his reelection and issues of economic inequality. What can we do, he asks his political advisers, to make voters “decide that they want to vote for us, Democrats? What is it we have to sell ’em? We hope we have to sell them prosperity, but for the average guy the prosperity is nil. He’s not unprosperous, but he’s not very prosperous. He’s not . . . very well-off. And the people who really are well-off hate our guts.’’ As questions about growing social inequity increasingly dominate our current political dialogue, it may be instructive to look back at how these issues played out a half century ago." See Tom Putnam's full OpEd in today's Boston Globe.